Where seen? 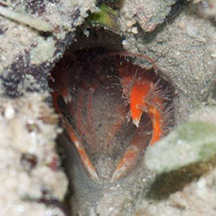 The smooth burrow of this large, brightly coloured animal is sometimes seen among rubble near living reefs on our Southern shores. But animal itself is seldom seen out in the open. 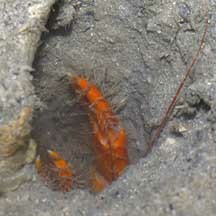 Often, all you might glimpse is just the tip of a bright orange claw in the distinctive burrow. At night, however, you may spot one near the burrow entrance as it does some housekeeping, or even wandering about outside. 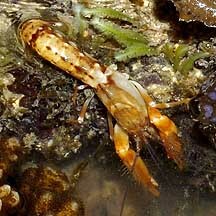 Features: 4-6cm long. 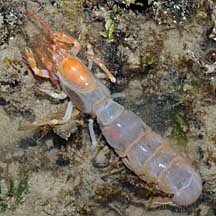 Long abdomen with broad tail, a pair of larger pincers, usually one much larger than the other. 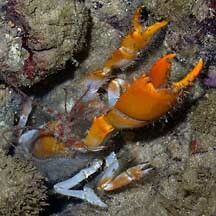 Pincers usually bright orange, smaller appendages and antennae banded orange. Body translucent, white or yellowish. 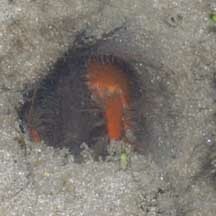 It can dig long, smooth sided burrows in solid coral rubble. The burrow looks like a PVC pipe! It is still not known how the little creature can achieve this feat. 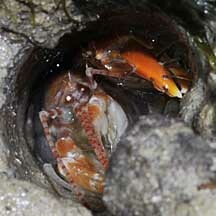 The burrows are said to be complex. 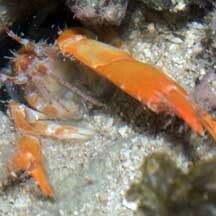 Coral ghost shrimp food: Most ghost shrimps species eat detritus and bacteria or on decaying seagrass and seaweeds. Human uses: In Australia, some species are caught by fishermen and used as bait. 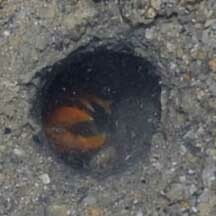 Burrow is smooth and looks like a PVC pipe. Rarely seen out of its burrow. Photo shared by Marcus Ng on his blog. 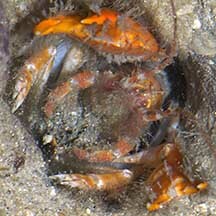 Family Callianassidae on Marine Lobsters of the World on Marine Species Identification Portal.